Last night I gave a little talk to our local Pacific Italian Alliance and my students who came about Roman agriculture and Cato the Elder. I decided that rather spend the afternoon cobbling together some images, I would cook something fun, and Cato's placenta beckoned. OK, not that kind of placenta, though the shape is the same, and the biological use of the term apparently comes from the name for the cake. Or is it a cake? I am inclined to think otherwise now. I have tried to folow Cato's directions using emmer groats, assuming Dalby's translation is correct. Alicae primae in older translations (Brehaut) is spelt grits. But I still fail to see how they can be worked into the flour dough without making impossible lumps that prevent the tracta from holding together. If anyone has ideas about this, please let me know. This time I used just flour. The filing between sheets is just washed sheep cheese (to remove the salt) i.e. feta, and honey. It resulted in a really nice sort of sweet lasagna. Everyone ate it and said it was good. By chance my olives were also ready, and they turned out quite nice, with a pleasant crunch. I also had my own sapa to taste - the entire year's harvest (10 gallons or so) reduced to about a bottle and a half. About 4 hours of slow simmering, which yeilded a gorgeously musty syrup. A little vinegar for fluidity in one bottle resulted in a fine balsamic-like product. Again, any suggestion for making tracta with alica, would be most welcome. It was not without some serious trepidation that I listened to a harried call from the Goddess of Meat and All Things Wild informing me that an entire specimen of Odocoileus hemionus (i.e. mule deer) would be imminently delivered to my doorstep. Luckily he, or she, arrived bereft of the more ungainly purtenances, bisected, and thoroughly chilled. I will kindly spare you, my gentle readers, the grisly snapshots, but I hope will trust my words to capture the moment when burnished steel met quivering flesh in an unprecendented feat of cisorifaction. To be frank, the experience was exhilarating. To hack through haunches, sever sinews, mince massive muscles, and dissect dainty dollops of dark red deer meat. There was nothing especially mysterious about rending steaks from the round, stew meat from the forequarters, chop meat from chuck, nor elegantly tying a roast of loin, or tiny sawn sections of osso bucco from the calves. With the staltward arms of two compatriots, we dispatched the beast in about 2 hours, plied with rum, and frantically filled freezer bags. That evening there were burgers and steaks (marinated in vermouth and juniper, a passing nod to the martini) on the barbecue. What possessed me to roast the bones, which could not possibly fit into my biggest stockpot, I can't say, but the choicest femurs went to Oonaugh, the wonder dog. So if you happen to pass the intersection of Yale and Lucerne where the resident tribe of carnivores hold their august sacrifices, be sure to stop by and pay your respects to the beast. We will keep the flesh pots burning. After a killer conference this past weekend at the CIA in Napa on Asian cuisine, it dawned on me that I hadn't seen my wok in ages. Could it have been lost in a move? Stolen by marauders? Vanished. 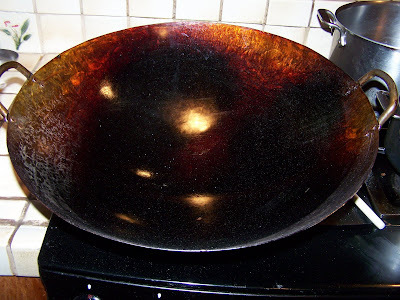 So I sallied forth to my local Asian grocery store and rifled thought the piles of teflon coated flat bottomed travesties and found a shiny new hammered steel wok. The biggest I could fit on my stove (though they had even bigger ones). On a whim I decided to season it with duck fat, and the results were truly spectacular. Here's the method: wash the wok and dry thoroughly. Put the whole thing in the barbecue grill, mine was just barely big enough, and crank up the heat, covered. Let it heat for about 15 minutes. Then rub a few tablespoons of fat all around the interior surface and cover the grill. Repeat 4 or 5 times, using nearly a cup of fat. The result is a gorgeously laquered vitrually non-stick surface, as shown above. For the maiden stif fry I did a simple medley of broccoli, carrots, baby corn and other sundry vegs. 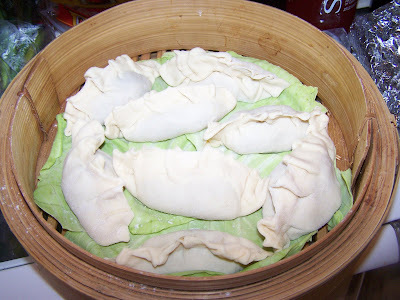 I also had to break out the steamer and made some shrimp ha gao, which I haven't done in ages. As well as a lovely red-cooked short rib dish with chilies, star anise, black cardamom and tangerine peel. Lush. Whatever could have lead to this long hiatus in Chinese cookery, I can't say, but the revival promises to be pretty exciting. 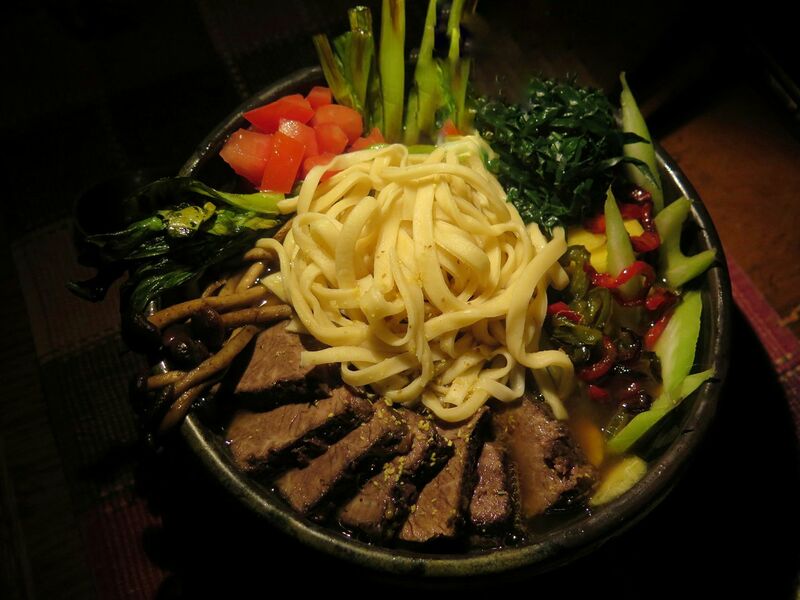 If you haven't seen it yet, go out and buy Fuchsia Dunlop's new book on Hunan Cuisine. Absolutely fabulous.